Martin was wearing a hoodie and had just purchased Skittles and iced tea when he was shot and killed by George Zimmerman in Sanford, Fla., on Feb. 26, according to police reports. Zimmerman has pleaded not guilty to second-degree murder charges. He initially told investigators he shot Martin in self-defense. WKMG Local 6's story said in an email exchange with reporter Mike DeForest that the unidentified seller wrote, "My main motivation was to make money off the controversy." The seller did not disclose how many paper targets were made, but said in an email, "The response is overwhelming. I sold out in 2 days." Some of those targets were sold to two Florida gun dealers, according to the seller. 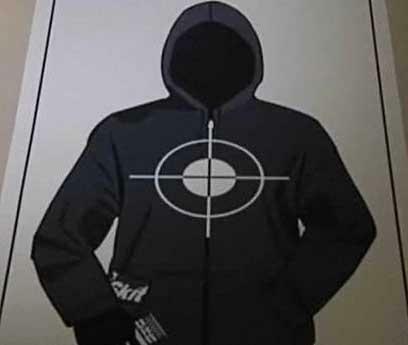 According to an advertisement for the targets posted on a popular firearms auction website, the sellers stated they "support Zimmerman and believe he is innocent and that he shot a thug," the television station reported. After being informed the station was investigating his online business, the seller said the targets would no longer be sold. "This is the highest level of disgust and the lowest level of civility," Zimmerman's attorney Mark O'Mara said in the news piece. "It's this type of hatred—that's what this is, it's hate-mongering—that's going to make it more difficult to try this case." The attorney is also concerned the targets will further inflame the community. The news channel said it reached out to Martin's family but did not get a comment.